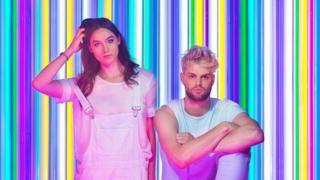 Sofi Tukker: Who are the band on the iPhone X advert? Art-pop band Sofi Tukker feature on the advert for the new iPhone X - but who are they? Formed in 2014, the New York duo are Sophie Hawley-Weld and Tucker Halpern (hence the name). Their song, Best Friends, recalls the anything-goes psychedelia of Deee-Lite, with an infectious bassline punctuated by horn stabs and cowbells. "You are my best friend and we've got some things to do," sing-speaks Hawley-Weld in the track's whimsical chorus. The singer and guitar player (who, in the lyrics, claims to be "addictive like some Pokemon") met Halpern at an art gallery while studying at Browns University in Rhode Island. "I was playing acoustic bossa nova music in a trio and Tucker was the DJ that night," Hawley-Weld explained to the Huffington Post last year. "He came early and saw what we were doing and ended up remixing one of my songs on the spot... We have been working together ever since!" Hawley-Weld was born in Germany and grew up in international school communities in Brazil, Italy and Canada. Her upbringing introduced her to a wide variety of music - as did her degree in West African dance and drumming at university - all of which filter into the band's eclectic sound. Halpern, meanwhile, is a Boston native who was set to play professional basketball (he's 6ft 8in) until health issues forced him out of the sport. Laid up in bed for eight months, he taught himself to be a DJ - leading to that fateful meeting with his bandmate. The band's debut single Drinkee, a colourful, danceable slice of pop, was released in 2016 and earned the band a Grammy nomination for best dance recording. "It was the first song we wrote," Halpern told Billboard. "It's why we started the band, really, because we believed in the vibe." Based on the poem Relogio by the Brazilian-Portuguese writer Chacal, the song is partly sung in Portuguese. "We wanted it to act like a chant in which the point is just the act of repetition," they explained to NPR - who presciently commented that the record sounded like the soundtrack to "a fashion week party or an Apple ad". Now that they've landed one of those coveted adverts, the band join a club that includes Feist, U2 and Florence + The Machine. They might be more self-consciously quirky than those acts, but there's a strand of playfulness to their music that suggests they could cross over to the mainstream. Hawley-Weld summed it up perfectly last year when she was asked how she'd explain her music to visiting aliens. "Hi Aliens," she told Mat Mag. "We're Sofi Tukker. This is called dancing, it is what people do when they want to be happy and feel free. Let's be friends!"